My family loves Brussels Sprouts. We love them so much we have tried to grow them in our vegetable garden, but we haven't had much luck with them. We find them at our local Farmer's Market but not often. It makes me wonder if they are difficult to grow! We love this cheesy version of roasted Brussels Sprouts. We are nuts about them! The hardest thing is the sauce and it's not really difficult at all! All the better in my book. How does your family feel about this cute vegetable? 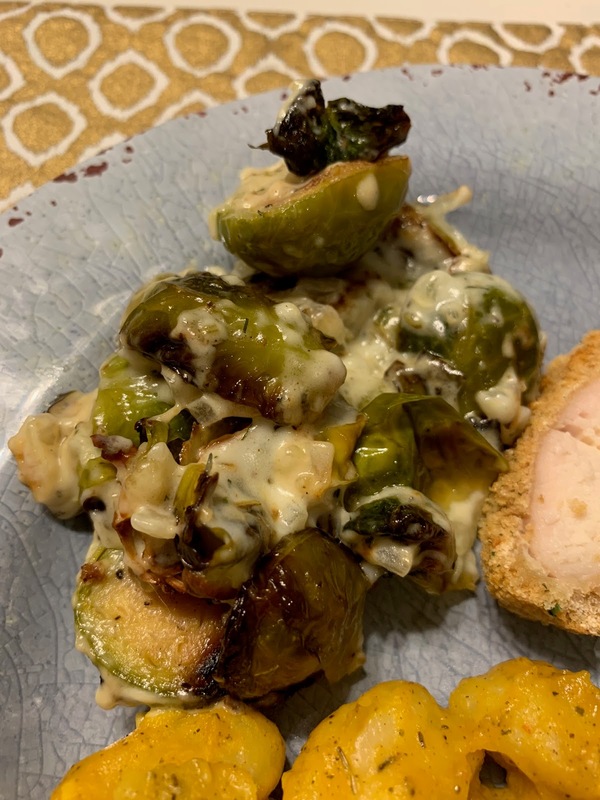 Roasted Brussels Sprouts with a cheesy sauce. Preheat oven to 400. Toss Brussels Sprouts with salt and pepper. Turn onto a baking sheet that has been sprayed with cooking spray. Roast 15 minutes, toss, roast 10 minutes more. Remove from oven and pour into a square baking dish coated with cooking spray. In a skillet, melt butter and cook shallots until translucent. Sprinkle flour over shallots, whisk, and add milk, whisk, until sauce begins to thicken. Add thyme and parmesan and 1/2 of the grated cheese. Stir until cheese melts. Pour the sauce on top of the Brussels sprouts. Top with the remaining cheese. Bake 15 minutes or until top is browned and bubbly.